Buhl native Frank Morgan published his first book "The Last Will and Testament of the Pirate John Blackjohn" on Oct. 11. TWIN FALLS — From high school drop out to lawyer to published author, Frank Morgan’s history could be a book of its own. But he looked back to the 16th century to find the story he wanted to tell. Morgan, a Buhl native, dropped out of Buhl High School his junior year and got a GED. He attended the College of Southern Idaho for two years, transferred to BYU and served his Mormon mission in Caracas, Venezuela. He got married and moved to Manhattan and fell in with a rough crowd before becoming a lawyer. After running with several, as he puts it, bloodthirsty legal crews, he hung up his cutlass and moved to Bermuda with his wife. 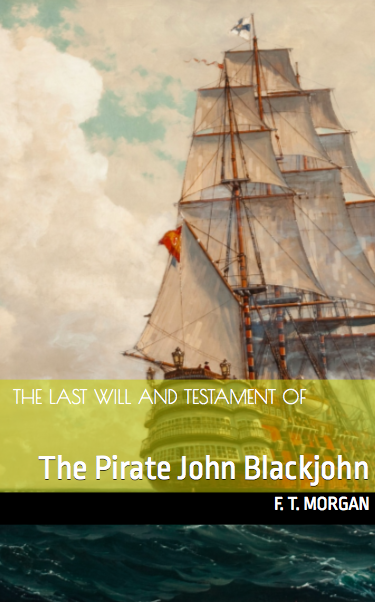 What’s the story behind “The Last Will and Testament of the Pirate John Blackjohn”? While I was still in law school — miserable, not fitting in, hating it, getting horrible grades, recession raging outside — I became fascinated with this bizarre historical figure: Francis Stewart, Fifth Earl of Bothwell, favorite nephew of Mary Queen of Scots, also known as Bloody Mary. In the late 1500s, James the Sixth of Scotland, later James the First of the “United Kingdom” of Scotland and England, the present-day U.K. I say James the Sixth put Bothwell on trial for witchcraft in North Berwick, Scotland. This was during the Scottish witchcraft mania, that ultimately spread to New England. Francis Stewart was this young, outrageous, larger-than-life character; one of the few men – and one of the very few noblemen — ever to be tried for witchcraft. I started thinking about a novel following Francis Stewart through the eyes of a poor farm boy who gets swept up on his escapades — and the tale just grew with the telling. 10 years of research and writing; hundreds of historical maps. This book is inspired by true events, can you tell me what those events are and what inspired you to write about them? This book is inspired by true scholarship: I’ve read enough history, mythology, psychology, paleoanthropology, and philosophy to apply for a Ph.D. My sources include “The Celts” by Jean Markale, “The Vikings” by Robert Fergusson, “The Reformation” by Diarmaid MacCulloch, “Europe and The Atlantic” by Norman Davies, “Bothwell and the Witches” by Geoffrey Watson, “God’s Secretaries and Seize the Fire” by Adam Nicolson, “Gods of the Indo-Europeans” by Georges Dumezil, “The Horse, The Wheel, and Language” by David Anthony and “A History of Western Philosophy” by Bertrand Russell. “The Last Will and Testament of the Pirate John Blackjohn” draws heavily on scholarly sources, re-framing Irish and Norse mythology in a new historical setting. This technique is called “magical realism” by some. What is your elevator pitch for this book? Inspired by true events, “The Last Will And Testament Of The Pirate John Blackjohn” is centered on strong female characters, despite its somewhat unusual title. Often compared to Susanna Clarke, and sometimes to Graeme Macrae Burnet, I reframe Irish and Norse mythology in a fresh historical context. Lighthearted and slightly lyrical, “John Blackjohn” follows the exploits of 16-century Scottish earl Sir Francis Stewart of Bothwell, as seen through the eyes of a boy and a girl swept up in his intrigues. Centuries later a Victorian doctor picks up the thread, and magic ensues. Star-crossed lovers meet and are parted. Villainy, heroism and murder-most-foul are explored through a magical lens that weaves Christian and pre-Christian spiritually into one symbolic construct. This deeply-researched historical romance brings to life the magic, the mystery, and the pervasive spirituality of the British Isles. Taking all this research that you put into this book, how were you able to put your own twist on this story? Sir Francis Stewart, fifth Earl of Bothwell, was one of the few men — and one of the VERY few noblemen — ever to be put on trial for witchcraft. I took Francis’ real-life story and simply ran with it. I imagined him as an honest-to-goodness sorcerer, and then I followed his exploits through the eyes of a boy and girl swept up in his intrigues. I confess: a lot of my twist is also autobiographical. My personal struggles – guilt, loneliness, ambition, mental illness, isolation, the feeling of being trapped; plus my overarching faith in, and hope for, a better world — are all lived out through my characters. They go through what I’ve been through, heroes and villains alike, in this symbolic re-imagining of Western European mythology. What were the challenges of writing your first book? For me, it was always terrifying just to open the laptop and dig in. To the aspiring author, I say “park on a hill.” I didn’t coin that. It means quit when you still have something good to say, so you can pop the clutch if need be and get that old Chevy that is your muse rollin’ again. Also, “there is no destination; only a journey.” If you’re asking yourself when your book will be finished, the answer is always “never.” And finally: “writing is re-writing.” I didn’t coin that either. A day of good self-editing is not a wasted day, even if you don’t add another word to your manuscript. Already writing it! It’s a novel called “The Star Mangrove,” and you’re gonna love it. This time I’m exploring Norse and Irish history and mythology...in a galaxy far, far away. Is there anything that you would like to add, maybe something I forgot to ask? I particularly encourage readers over the age of 40 to give “John Blackjohn” a try. I think they’ll pick up on who my real hero and heroine are. Young people are passionate, yes, but they’re not always interesting. I think mature readers will find my unique romance to their liking. I have already purchased the book and I'm really enjoying it so far. It's clear that the struggles the author has confronted have contributed to a beautifully-written, creative, and entertaining novel. I learned more about the book and Frank Morgan at www.morganpublishers.com.